A tailspin is a fast, helpless fall into a very bad situation. "Tailspin" is also a verb: tailspin, tailspinned (not "tailspun" as you might guess, although people do say it that way), tailspinning. For the noun, talk about something going into a tailspin, falling into a tailspin, being in a tailspin, being sent into a tailspin, and so on. Sometimes you'll use the plural: "This economy is in total tailspins." You can also talk about something's tailspin or someone's tailspin, or a tailspin into something: "The narrator's tailspin into madness is fascinating." For the verb, talk about something tailspinning: "The game tailspinned after my opponent bought Park Place." Oh, you found a new show you love on Netflix? And there are five seasons of it available? Get ready to tailspin into utter laziness for the rest of the weekend. My sister doesn't like the tailspin into unconsciousness that Nyquil sends her into. Look away from the screen to explain the definition in your own words. 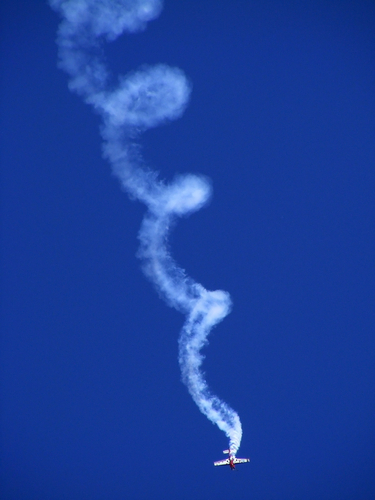 You’ll know you understand what "tailspin” means when you can explain it without saying “crash and burn” or “collapse." Think of something in your life that you experienced or noticed that went really bad really fast, and fill in the blanks: "I witnessed _____'s tailspin into _____." Example : "I witnessed the calm discussion's tailspin into a bitter fight focused only on blame." A. rooming together and discovering each other's irritating habits. B. taking a road trip together and finding new ways to bond. C. discovering you two have nearly opposite tastes in music.